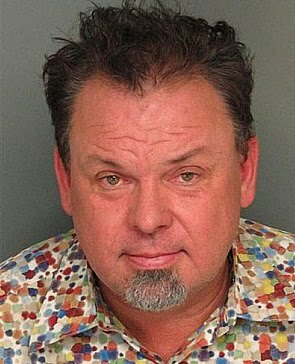 So the famous, now infamous painter of light has been arrested for DUI. While I think this is not the worst thing someone could do– it is certainly – I don’t know– weird maybe. Thomas Kincaide has to be one of the most beloved loathed artists of all times. He made it big by peddling nauseatingly gimmicky paintings to the entire world. I mean at least Bob Ross was cool. So he was loved by all the A-holes that bought his repainted prints and loathed by most artists that were sane. The fact that he made it big showed the art world was closer to kissing cousins than it was to caviar and foi gra. Not that I would eat foi gra, but thats besides the point. He made a a head spinning fortune for a living artist, and lost it all to boot. He lost all his money by frauding the same galleries that made him rich. I really don’t know what to think except maybe Thomas F-wad Kincaide is a genius. He is in a financial shithole and now he is all over the news again. I bet his stock has risen– in whatever form it is. Could his Paris Hilton-esque tactics work… I really couldn’t predict. Two of my friends bought prints of his, and I couldn't figure out why. It had no appeal to me…just another reproduction. I always saw his work hanging at shopping mall art galleries, but couldn't figure out why his work was so popular or why anyone was willing to pay more $ for a numbered/serial print as if it had some sort of mystique. He was an artist alright…a “scam artist”. Thanks for informing us.